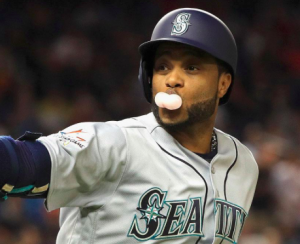 As it turns out, getting hit by a pitch and breaking his hand wasn’t the worst thing to happen to Robinson Cano this week. On Tuesday, Major League Baseball hit the Seattle Mariners second baseman with an 80-game suspension after he tested positive for a banned substance. Cano tested positive for Furosemide, which is a diuretic banned by MLB’s Joint Drug Prevention and Treatment Program. Cano received Furosemide from a practicing physician in the Dominican Republic. The 35-year old veteran says he received it for medical reasons but did not realize it was on a list of banned substances. Furosemide is more commonly sold under the name Lasix. It can be used to treat a number of medical conditions, including high blood pressure, kidney disease, or liver scarring. However, the drug is often used as a masking agent. According to reports, Cano tested positive before the season. Testing positive for a diuretic doesn’t result in an immediate suspension. However, an independent administrator proved that Cano used Furosemide as a masking agent. In recent days, Cano gave up any inclination of appealing the positive test or the suspension. It’s merely a coincidence that he decided to do that right before getting hurt. The 80-game suspension will cost Cano $11.85 million from his $24 million salary. If there’s a silver lining it’s that Cano’s suspension will coincide with his stint on the DL. The 80-game suspension will begin immediately, regardless of the fact that Cano was placed on the DL Monday. Of course, Cano is likely to miss a few weeks because of the injury. The suspension, on the other hand, will cause him to miss nearly half the season. Cano won’t be eligible to return until the middle of August. It will also be ineligible for the postseason should the Mariners qualify. Prior to going on the DL, Cano was hitting .287 with an OPS of .825. He continued to be one of Seattle’s most important offensive players. The Mariners called up veteran Gordon Beckham to help fill the vacancy at second base. Utility man Andrew Romine should also see some time at the keystone. But having those two players fill-in for a month is different from having them replace Cano for three months. Cano’s suspension could force the Mariners to look outside the organization for a second baseman. The club has already said center fielder Dee Gordon would not be moved back to his natural position to replace Cano. The Mariners are currently 1.5 games behind both the Astros and Angels in the AL West. Keeping pace with the reigning World Series champions and the reloaded Angels was always going to be tough. Losing one of their most impactful players for half the season because of a suspension just made that task all the more challenging for Seattle.